Crawler Mucking LoaderDescription of Crawler Muck Loader: The crawler muck loader is also known as tyre belt haggloader. We mainly provide two kinds of crawler mucking loader for clients worldwide: crawler muck loader for big slopes and crawler muck loader for level surfaces. Wheel Mucking LoaderIntroduction: The wheel mucking loader, also known as wheel haggloader or wheel tunnel excavator, is a type of underground mucking loading machinery mainly used in narrow space mining operation such as metal mine, water transferred roadway, etc. Track Mucking LoaderThe Track Mucking Loader is also known as tracked haggloader or mining track loader, and it is mainly used in mine, railway tunnel, national defense engineering, hydraulic engineering, etc. By adopting advanced technology at home and abroad, we develop this new, high efficient and energy-saving engineering machinery. The mucking loader, also called haggloader, is a kind of underground construction machinery typically used in the excavating of tunnel mining, mine engineering and hydraulic engineering. 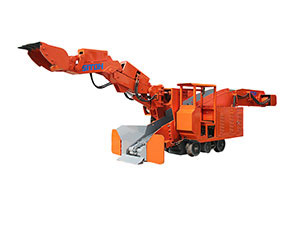 The mucking machine has five functions: Hydraulic transmission, excavating and collecting, transport, loading and cleaning. 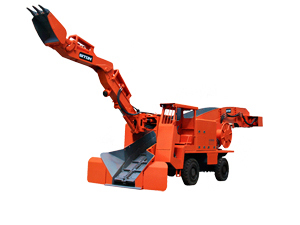 This mucking loader or haggloader is also utilized to collect and convey the gravelly soil in the process of production operation of small phosphate with narrow space and small scale of production. Most of the mucking loader that is used in tunnel construction is the type ITC312 made from German. The theoretical loading capacity of this haggloader is 312 cubic meters per hour. With a loading capacity of 80 cube, 100 cube, 120 cube, 150 cube, 180 cube, 200 cube, 220 cube, 260 cube, 312 cube, 330 cube per hour, the load-haul-dump loader includes the ordinary type and the heavy grade. Our muck loader can be divided into eight different types: coal mine, rock loading and excavation, tunnel excavation, underground engineering, to name a few. While, according to the different minning or tuneling conditions, we especially designed all kinds of haggloaders to meet the needs, such as crawler muck loader, Track Mucking Loader, and wheel mucking loader and so on. The mucking loader has five functions: Hydraulic transmission, excavating and collecting, transport, loading and cleaning. By adopting the production equipment with electric hydraulic control system, it is environmental-friendly, low consumption, high efficiency, etc. Thus, the mucking loader or haggloader, is essential and advanced mining equipment which can be used to replace manpower and other mechanical equipment. 1. The hydraulic transmission works under the operation of hydraulic motor, reduction gears, transmission shaft and reduction box. The hydraulic motor can move forward, draw back and brake automatically. 2. The excavating and collecting can be accomplished by the manipulator. 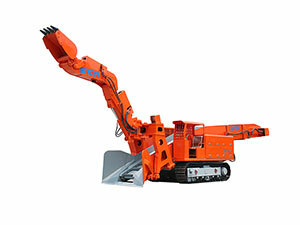 The manipulator has the performance of excavating, semi-girder, loading and unloading. It is manipulated by the full hydraulic control system and operated by the two control handles. 3. The loading of this haggloader is completed by its conveyor. And the width of the conveyor is 650-700mm and the transfer rate is 800-900mm which makes the mucking loader has a high working stability. The mucking loader depending on its functions of moving, excavating, collecting, conveying, loading, and place cleaning, can work continuously with high efficiency. 4. In the mean while, the mucking loader, or haggloader, used in underground heading, excavating and transportation, provides a good safety insurance of the underground engineering construction. Company Brief: Founded in 1992, Siton machinery manufacturing Co., Ltd., is a professional haggloader manufacturer in China. This mucking loader is useful for tunnel excavating and mining haulage. With years of experience, we can supply a full range of mining equipment such as coal mucking loader, rock mucking machine, tunnel muckers, etc. In addition, we have obtained the security certificate and the patent certificate of national grade. As a result, Siton can possess more than 60% market share. Our products are well received in Canada, Morocco, Algeria, India, Kazakhstan, Vietnam, Laos, Nepal, etc. More information about our muck loader, please contact us freely. Also, welcome to visit our factory.